Why didn’t they have this when I was a kid? With the Civil Engineer Tape, you can lay down roads on the carpet letting you turn the entire carpet into city streets. Building roads can now be as simple as laying them down in SimCity. It is every kid’s dream to have their very own miniaturized city landscape to play with. The Civil Engineer Tape works best on carpets as it can be easily removed but it can also work on any floor. If properly removed, they can also be reused. Great for the young ones. Hours of creative fun building a city with realistic looking roads for toy cars. Each role of Civil Engineer Tape lets you build up to 25 meters of roadways. The roadways have details such as road dividers, intersections and even cross walks. Combine the tape with some road signs and traffic lights for even more fun. 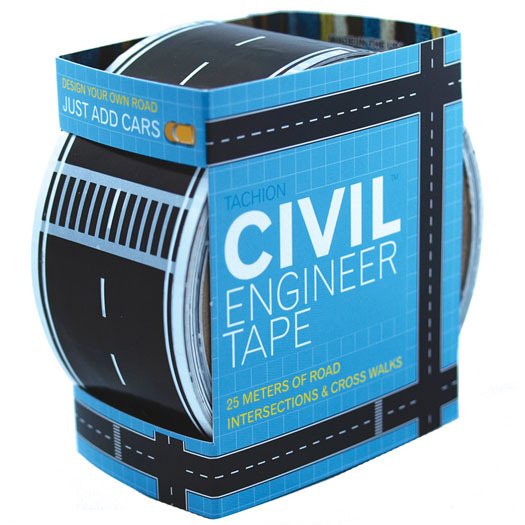 Use this terrific Civil Engineer Tape to lay roads down on your carpet or maybe put some roads down on cardboard and draw a town in. Just add cars.